Amazon has launched another piece of hardware, but this one does something different than the Echo, Tap, and Dot smart speakers Amazon Echo vs. Dot vs. Tap: What Are the Key Differences? Amazon Echo vs. Dot vs. Tap: What Are the Key Differences? One common complaint against Amazon Echo was that it had too many features and cost too much. Amazon's response to that? Releasing two variations with smaller price tags: the Tap and the Echo Dot. Read More . The Amazon Echo Look is an Alexa-powered camera designed to dole out fashion advice to those who need it. Useful? Probably. Narcissistic? Definitely. It may have started life as an online bookseller, but these days Amazon is so much more than that. Not only does it sell anything you can think of, the company has its own range of hardware. 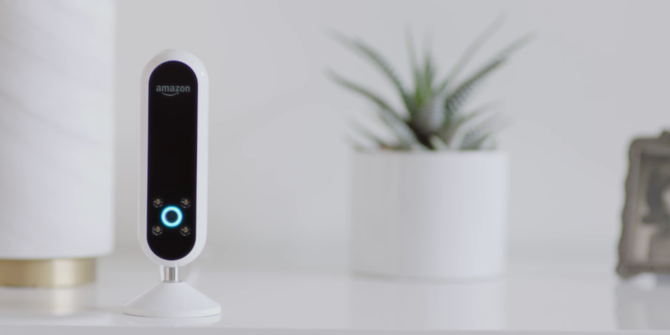 Not content with ebook readers and smart speakers, Amazon has now launched a smart camera too. The Amazon Echo Look is another Alexa-enabled smart home device. It can do all of the same things the other Echo devices can do, but the Look is focused on photos and videos rather than audio. There is a small speaker built in, but it’s more for listening to the news and weather. The Look lets you take photos and short videos using a hands-free, voice-activated camera. You’re guaranteed to look good thanks to LED lighting, background blur, and a depth-sensing lense. Which makes it perfect for anyone who posts pictures of themselves on social media all the time. As well as helping you share photos online, the Look will build what Amazon calls a personal lookbook of your various outfits. But the main draw is the Style Check, which lets you pitch two outfits against one another based on a combination of fashion specialists and machine learning. Amazon is currently selling the Echo Look on an invitation-only basis. To bag one you’ll have to request an invitation to purchase for the opportunity to hand over $199.99 to Amazon. And then all that’s left to do is have your fashion sense constantly critiqued by our future robot overlords. The Amazon Echo Look is a rather strange proposition. It certainly doesn’t feel as mainstream as a speaker capable of playing any and all music All the Ways to Play Music Using Your Amazon Echo and Alexa All the Ways to Play Music Using Your Amazon Echo and Alexa The Amazon Echo excels at playing your music. Here are all the ways to listen to music using your Amazon Echo and Alexa. Read More . And yet, if you’re the type of person obsessed with how you look and vain enough to share endless selfies on Instagram, it may well be for you. Do you have any interest in the Amazon Echo Look? Can you see the appeal of Alexa giving fashion advice? Do you have your own sense of style? Would you trust the advice? Or suspect it’s designed to make you buy new clothes? Please let us know in the comments below! Explore more about: Amazon, Amazon Echo, Fashion, Photography, Selfie. I'll probably wind up with one. Not because I take selfies or use social media, but because I'll more than likely be expected to teach others how to use one. I suspect its style advice for me will be amusing.